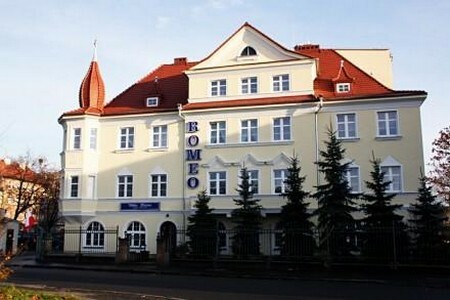 Villa Romeo is an elegant and luxurious hotel, located near the central Brzeg. Villa Romeo has 40 comfortably furnished and spacious rooms. that are sure to satisfy our guests when it comes to comfort and convenience, and a banquet hall for 120 people and a solarium. The hotel offers rooms: * single * double * triple * quadruple. All rooms include * wireless Internet * TV * bathroom with shower or bath. Visitors to the site can use the following services: car wash, auto repair shop - BMW service , a tailor, "Agrafka", and a laundry. We offer access to the internet, and parking - free of charge.